Many people think of the Smoky Mountains primarily for their autumn colours and summer recreational activities, but the Gatlinburg area is a great place to spend a rustic Christmas. A surprisingly affordable option for enjoying the town and national park are cabins in Gatlinburg, which range from single family locations to even bigger cabins. These five Gatlinburg cabin rentals are decorated for Christmas, perfect for making holiday memories together. Several of our mid-size cabins are adorned with decorations for Christmas and they make a perfect spot for four to six people. One of the highlights of the cozy Canterbury Cottage is the wood-burning fireplace in the living room, which also has two comfy couches. Let the kids enjoy the games room, with air hockey, ping pong, and pool table while you relax in either the jacuzzi or hot tub. There is a king bedroom along with two queens, plus you can bring a furry friend to this pet-friendly cabin. Hunker down amidst the forest canopy in Owl’s Nest for a peaceful Christmas in this lovely A-Frame cabin. With two bedrooms on different floors and a pair of bathrooms, there will be room for everyone. The spacious living room is great for a family games night, with comfy sofas under a beautiful vaulted wood ceiling. Cuddle up in front of the fireplace for a quiet evening or take in the fresh mountain air on the wraparound porch, which features a hot tub and picnic table. Fire up the grill or cook dinner in the full kitchen and enjoy your time together this holiday season. For a little more room, you can all sleep tight in Smoky Mountain Dream, a three-bedroom, two-bathroom chalet lovingly adorned for the season. Each of the bedrooms has a large flat screen, plus there is a whirlpool for ultimate relaxation. The large dining room table and high-backed chairs are perfect for enjoying a holiday meal as a family, but can double as a table for board games or cards. You will also not soon forget the breathtaking view of the Smokies from the back porch, which has its own hot tub. 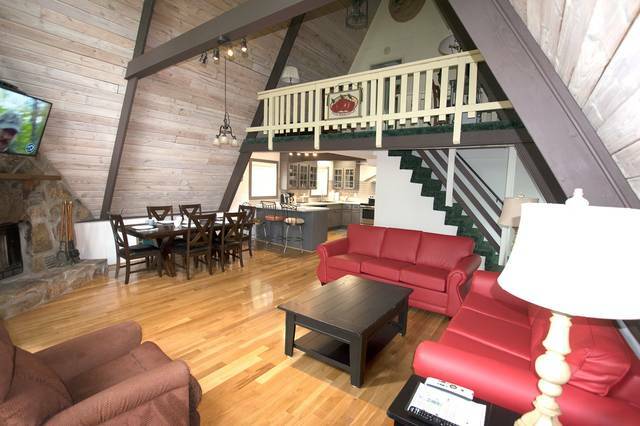 Make it a proper family reunion at Mountain View, a three-level A-frame chalet with incredible panoramas of the Smokies. The spacious, newly-remodeled living room features a fireplace set into a tall stone mantel, with a huge flat-screen mounted above. There are four bedrooms and four bathrooms, so up to 12 can sleep comfortably, plus with multiple decks and a large, ultra-modern kitchen, you can enjoy plenty of family time. You can even bring the dogs to your big family meet-up. Whether you are thinking of a Christmas getaway just for the immediate family or for a larger group, these cabins in Gatlinburg will bring you lots of yuletide cheer with their great views, fireplaces, hot tubs, and welcoming decorations. Plus, they are near the lights of Gatlinburg, the fun and entertainment of Dollywood, winter sports in the national park and Ober Gatlinburg, and much more. So book one of these beautifully decorated Gatlinburg cabin rentals now!